Last week, the House Ways & Means Committee passed the Joining Opportunity with Benefits and Services (JOBS) for Success Act (H.R. 5861), which reauthorizes the Temporary Assistance for Needy Families (TANF) program for five years and makes some fairly significant changes to the program. While we were pleased with some of the changes included in the (JOBS) for Success Act, including the addition of child poverty reduction as an explicit goal of TANF, we remain very concerned that the changes to TANF proposed in the bill will not significantly strengthen TANF’s ability to reduce child poverty. Research makes clear that money matters to child well-being. Numerous studies show that when family income rises, it has positive effects for healthy child development, including academic achievement and educational attainment. TANF is the only federal program that provides cash assistance for families, which is critical to help with the cost of resources not covered by other programs, such as diapers, clothing, transportation, utilities, and more. 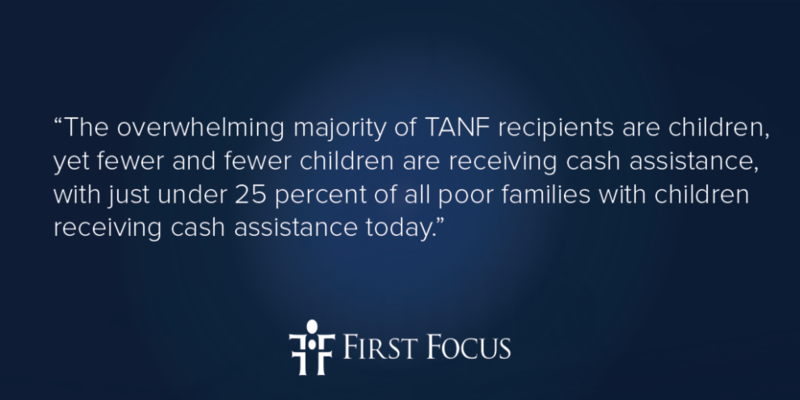 The overwhelming majority of TANF recipients are children, yet fewer and fewer children are receiving cash assistance, with just under 25 percent of all poor families with children receiving cash assistance today. As a result, the effectiveness of TANF in reducing child poverty continues to diminish. Due to its nature as a fixed block grant, TANF is not able to be effective in responding during times of increased need and the block grant has fallen in value by over 30 percent due to inflation since 1996. The JOBS for Success Act does not propose to increase funding for the block grant or improve upon the ability of TANF to respond during times of increased need. Without improvements to these aspects of the program, TANF’s potential to reduce child poverty in the U.S. remains limited. The shift to evaluating state performance based on parental employment outcome measures is positive, however, states must be held accountable to helping people exit TANF with quality employment that provides their family with a wage sufficient for long-term household economic security. States must also allow parents to meet work requirements through pursuing higher education, skills training or vocational education, and guarantee child care assistance, transportation assistance, and other supports. Yet the overwhelming majority of TANF funds go to children, and nearly 40 percent of TANF cases are “child-only,” meaning that only the child in the household is receiving assistance. Therefore, in order for states to meet this added goal of reducing child poverty, it is critical that state performance is not only measured on parental employment upon leaving TANF, but also on how many children are lifted out of poverty in all TANF caseloads. During the mark-up, Congressman Danny Davis offered an amendment to create a national child poverty target in the U.S., which would set the goal of cutting child poverty in half within a decade and eliminating it within 20 years. As members of the U.S. Child Poverty Action Group discussed in a letter sent to the Ways & Means Committee, this would be a significant step in holding federal, state and local governments accountable to reducing child poverty through TANF and other programs. While this amendment failed, we were encouraged that Chairman Brady and Congresswoman Jenkins’s expressed a commitment to working with Congressman Davis’s office on this effort. Reaching economic security is a long road for many families. While parents and caregivers are working towards upward mobility, we need to ensure that every family is provided with enough cash assistance to provide sufficient resources for children while their brains are undergoing critical stages of development.